What an incredible month we had in December 2013. Such an exciting time to serve the Lord! We started the month off by having a weekend Marriage Seminar. AIMers Cole and Stacie Panton did an excellent job teaching us the keys to a great marriage. We had about 25 enrolled in this seminar. We were able to connect with the First UPC and do some joint outreach. We decided to do some Christmas caroling in a church neighborhood. How exciting it was to see Japanese come to their doors and balconies to watch us sing. By doing this both churches had many first time visitors. This month we had three people baptized in Jesus name. 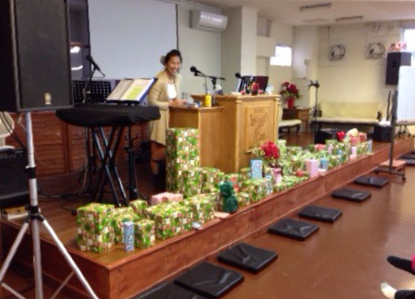 What a joy it is to see Japanese get to know Jesus for the very first time. We finished the year off with a special watch night service. We had a foot washing and a communion service. Many who were there had never been to a communion service before. Then we began to worship the Lord to bring in the New Year. After this was done, we did the traditional Okinawa New Year eating of Soba Noodles. The National Conference 2014 was a great success. There were upwards to 2,000 in attendance and at least 120 received the baptism of the Holy Spirit. The church elected their first national president. A new church was opened with thirty-one in attendance the first Sunday. The official opening for one church will be the first weekend of February. This is located in a voodoo village. The church currently has over ninety members but is fighting against the Animist/voodoo believers. Celebrate with us at this church opening, but still pray that many will be won to Christ. Missionaries ministering in the English part of the country saw four receive the baptism of the Holy Spirit. Missionaries ministering in the French part of the country saw three receive the baptism of the Holy Spirit. During Christmas revival services a total of eighteen were baptized in Jesus' name and four received the baptism of the Holy Spirit. A total of five were baptized in Jesus' name. One of those baptized had decided to follow Christ at the New Year's Eve service. One pastor who is a former Bible school graduate opened the third church in his area and has already baptized nineteen in Jesus' name. A church plant had an inauguration service and is now a church. Over the one year of being a church plant there were fifty-five baptized in Jesus' name. In the capital city there were thirty-seven baptized in Jesus' name and thirteen received the baptism of the Holy Spirit. One church was able to purchase land. There was a crusade and we praise the Lord that twenty-four received the baptism of the Holy Spirit and eleven were baptized in Jesus' name. One pastor baptized thirty-four in Jesus' name and twenty received the baptism of the Holy Spirit. Five Trinitarian pastors are now sitting in bi-weekly Oneness meetings in one of the states. The balcony is being built in the new national headquarters' church. It will seat 1,200 people when completed. Plans for the building of the classroom block for Bible School has finally been approved by the city. Construction will begin immediately. 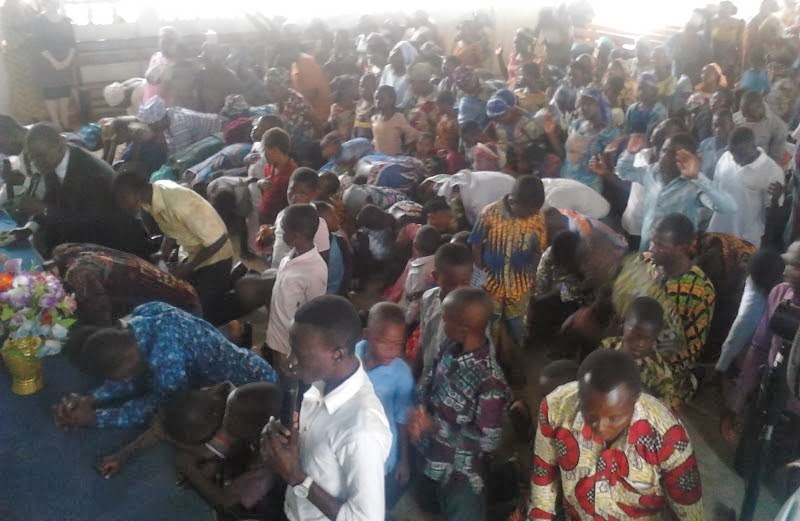 At a conference in the western part of the country there were twenty-eight baptized in Jesus' name and forty-eight received the baptism of the Holy Spirit. Eight new churches have been started in the last six months. One Trinitarian pastor has returned to our church. He was baptized in Jesus' name as a young man but moved with his parents who were Trinitarian pastors. Now he has moved back to his home area and has returned to truth. Many have testified of healing from sickness. We hope that you have had a wonderful holiday season. We made it through two Christmases and two new years. The Georgian celebrate the traditional Orthodox Christmas and new year as well as the new ones. Of course, there isn't a whole lot of gift giving going on in their version of it. Just good food and good friends for new years. Christmas is a bit depressing here as it is a religious holiday, and anything connected to religion has to be sad and somber to them. As you can see from the picture above though, New Years here is awesome. Each person contributes to the fire work show by lighting off their own fireworks. The people of the city will light up the whole city for about an hour with this awesome display. This year we bought some fire works and joined in. 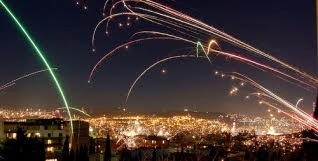 I remember it wasn't fireworks that they were shooting off but rather live ammunition. When we first got to Georgia, we had to stay inside for most holidays because those bullets do eventually come down somewhere. I remember a guy that shot a rocket propelled grenade into the local lake. Most of that has gone now, and the fireworks are what has taken its place. Thank God for improvement! Thank you to all of you who helped to make our families Christmas a bright one. May God bless you as you have blessed us. As you can see above, New years is awesome here in Tbilisi. Hope your New Years was as fun as ours was. Before doing anything else, we read the Christmas story from the book of Luke. Then we thanked God for the best present of all, Jesus. As soon as we finished, the girls ripped into the presents that we had gotten them. Needless to say they had a fun day. 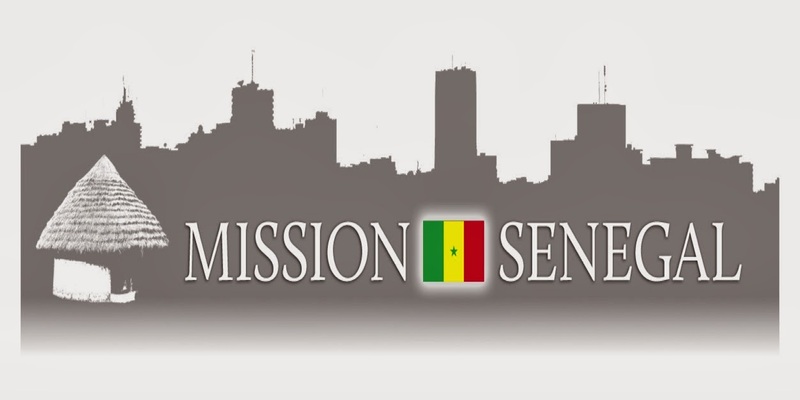 18 people were baptized in JESUS name at the Lomé Civil Prison on Monday, December 16. These 3 women and 15 men are free from sin's dark captivity. Pastor Ahiale Kofi and his church lead this outreach to those who live in terrible conditions while paying their debt to society. Click here for more pictures!! 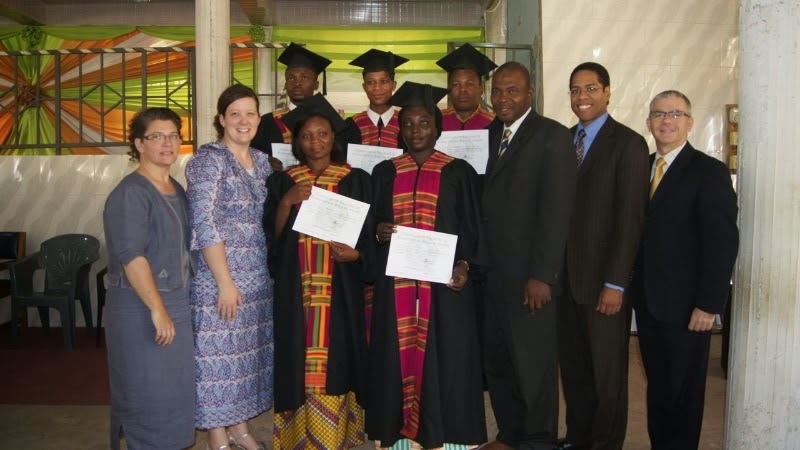 On December 8 our family traveled to Tamale, Ghana to preach the graduation of their northern extension Bible College. We truly enjoyed being with fellow missionaries Colleen Carter and Nick Sisco! Click here to see more pictures of this event! Because of your prayers and faithful giving, lives continue to be transformed!! 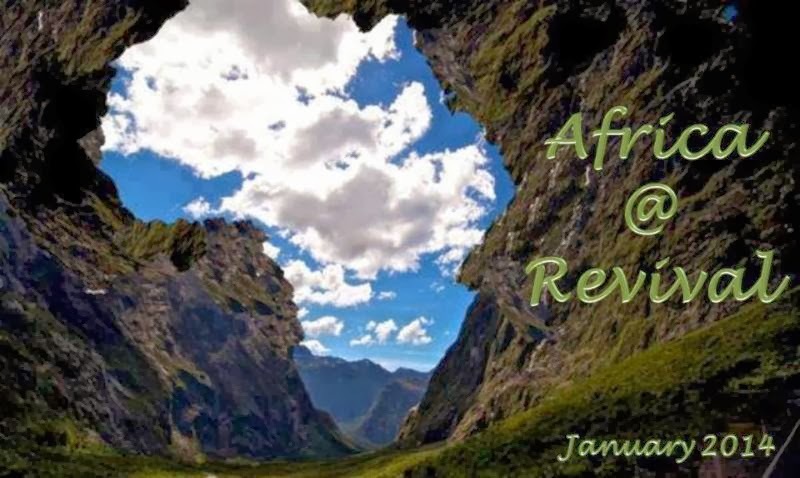 You are a part of a great harvest of souls in West Africa!! Greetings from Munich in Jesus’ name! It has been a month full of year-end travel and meetings as well as planning and sowing. We have consistently held services in Munich and have had good services. But we are not satisfied! We have taken to the streets in prayer. We have set out along the train lines and selected spots to go and pray (see map ^). We have gone out on different lines to different sections of the city, walking, praying, sometimes speaking with people and handing out tracts. We have a desire to sow seed in our city! Please pray with us as we break some new ground in the city as we promote to get the word out in Munich. There is a church that lives and breathes beyond the bounds of the traditions that hold the city captive!! There is more than a Christmas choir in a historical building where the name of Jesus might be sung in a song, more than a “Christ Child Market” in a beautiful historic district of the city — there is an EXPERIENCE to be had with Him, and a plan of Salvation for every person! I have spent 20 days of December travelling, so it has been difficult to manage our initiatives. A couple of those days traveling was for our General Board meeting in Paderborn, Germany. There are many things happening in our region, and it is exciting! We are planning for our next General Conference in Nürnberg! We are planning our next session of the Apostolic Ministry Training Center this year — in 3 different locations in 3 different countries and 4 languages!! We are laying the foundation for new churches! So it was fitting when Brother Ernest Scott put his Shofar in the hands of Brother Charles Robinette, our General Superintendent, to sound a peal of triumph after our meeting! We thank you all as partners for your love, help and consistency—may God richly bless you for your share in the burden of Jesus Christ! Favor in evangelizing throughout Munich! Employing the most effective channels of getting our word out! An apartment for AIMer Petra Hugon-Smith! Miracles, signs and wonders as we go out into Munich in faith!